"Why are my tomatoes cracking"? With the progression of the growing season, backyard gardens and patio planters are bursting with the long awaited fruits and vegetables, some New England gardeners are finding that their tomatoes are splitting on the vine. “Why are my tomatoes cracking”? I was asked by a lovely, young gardener. So many customers come into the store and feel terrible when something has gone a bit wrong with the plants that they have so lovingly planted, nurtured and watched grow; they take it so personally when something goes amiss. Problems with fruits and vegetables at this stage of the season is usually a result of something that occurred earlier in the season, and most times it has to do with hydration or nutrients in the soil. Tomatoes splitting is an indication of a real fluctuation of watering, from nature (in some cases the gardener) but it is a result of weather conditions nine times out of ten. The Boston area and most of the east coast suffered from extreme heat and sun with very little rain for the months of June and July, providing great conditions for growth and the formation of fruits and vegetables. The long dry months kept gardeners on their toes with hoses in hand to keep the plants well-watered; but as we all know unless there is a timed irrigation system in place, watering regularly with even amounts of water is nearly impossible when done by hand. Mother Nature has the upper hand and rule she does, we just adjust to her conditions. Rainstorms have been a bi-weekly occurrence for the past several weeks, not just a nice summer rain…no, extreme amounts of water has been falling causing flash flooding in Massachusetts and surrounding states. A town just north of Boston had a record-breaking rainfall of 7 inches in one hour causing destruction and devastation of roads and homes. With that amount of rain and days of clouds and overcast skies Mother Nature reigned supreme and gardens adjusted, while gardeners had a break from watering… the plants were soaking up all that non-stop moisture with no sun to help with a quick evaporation process….tomatoes especially literally exploded! The formed fruit absorbed the moisture into the pulp of the fruit at a rate that the skin could not keep up with, resulting with split tomatoes! Some splits happen overnight and are just a surface crack, that fruit should be harvested and eaten. Some fruits quickly heal over and have rings that show the scars, they are ugly but edible. Any fruit that has a deep, open, cavernous crack, because it was left on the vine too long or hidden, should be tossed. A deep wound can invite insects and disease…why risk passing any pest or disease into a compost pile. Feeding the plant with an organic fertilizer may help to even out the growth rate, but still splits may happen. 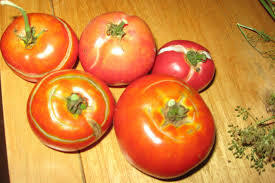 If you suspect the tomatoes may be on their way to show a split, take control, harvest early and let them fully ripen on an indoor window ledge, that way if they do happen to split, no pest or fungus will take hold. Consume split fruits as soon as possible, break out some recipes and enjoy the harvest! So basically; the condition of any produce is a result of the growing conditions. You cannot control Mother Nature but you can revel in her aftermath and make a tart, a pie, a sauce, a casserole, some salsa or jam…you have heard it all before: “when life gives you lemons”……enjoy it all!